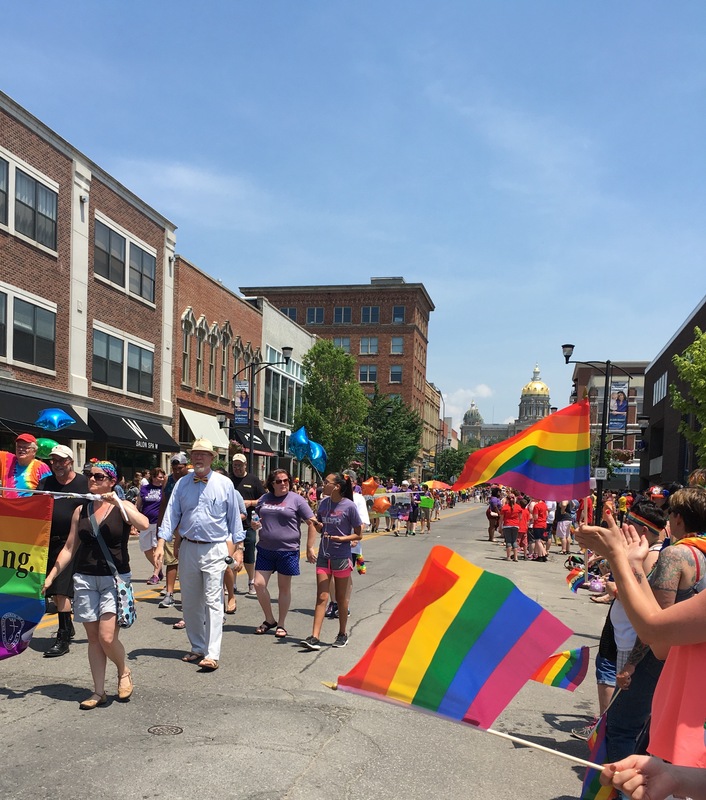 The annual “Pridefest” in Des Moines took on new meaning after Sunday morning’s mass shooting at a gay nightclub in Orlando. Martha Miller-Johnson of Des Moines was part of the Pridefest scene Sunday afternoon just blocks from the state capitol. She was all too familiar with the site of the massacre in Florida. 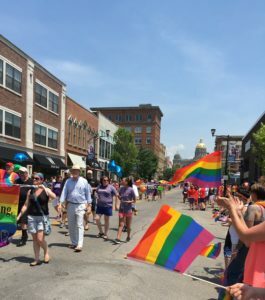 She and her husband, David Johnson, were standing in the sunshine, along the Capital City Pridefest parade route, as the crowd cheered each passing entry. Matt Roberts of Des Moines learned about the shooting early Sunday morning. “My best friend and then my mother called me, back to back (and said:) ‘Did you hear about it? '” he said. Roberts used to visit Orlando regularly and he’s been to the Pulse nightclub where the mass shooting happened. Roberts said he’s been texting friends and checking Facebook for information. Some people in the crowd, though, thought twice about venturing out to such a public event. Tanya Holmes of Des Moines said fear is a normal reaction to the news a gay nightclub had been targeted. But Holmes said she came anyway, to support a friend. Kevin Brown worried about going to the parade because he and his partner brought their children. Taylor Walker of Norwalk got up Sunday, checked Facebook and found out about the shootings in Orlando. A few hours later he was standing along the street in downtown Des Moines, carrying a large gay pride flag. Some in the crowd held handwritten signs that read: Pray for Orlando. A brief vigil was held Sunday night on the statehouse steps. All but one member of Iowa’s congressional delegation responded to the violence in Orlando with comments on Twitter. Senator Joni Ernst called it a “senseless act of violence” and Senator Chuck Grassley called it “terrorism in America again.” Both Ernst and Grassley are Republicans. All five urged their Twitter followers to pray for the victims. Read the statements below. @RepRodBlum tweeted: Thoughts and prayers for all those affected by the senseless attack in Orlando. “Early this morning, dozens of innocent men and women were murdered at an Orlando, Florida nightclub. While this attack happened at an LGBT+ nightclub, it was an attack on all of us. Whether you are gay or straight, identify as male or female, white or black, or old or young, this is a time to stand as one against such senseless violence, and stand as one we must. As we continue to gather facts and learn more information, let us all turn our attention to the victims and their loved ones. Let us keep the family and friends of those killed and injured in our thoughts and prayers. Let us praise the law enforcement officers and medical professionals who responded with such courage and compassion, Let us extend a hand to those who survived as they cope with the tragedy and trauma.